Did you notice the cool start this morning? The air is very dry and allows for quick cool downs and a quick warm up. This morning's low was 65°. We haven't been that cool since July 2nd. Speaking of July, read my wrap-up on last month at JULY WAS ONE HOT MOMMA'....my August preview is out as well and can be viewed here. Look for temperatures to hit 95°+ this afternoon (record high is 97 from 1999) across the Upper Cumberland under a sunny sky. We had a high of 91° yesterday in Cookeville and the heat will continue to intensify in the next day or so as we expect 97° on Wednesday. Building clouds will help set off a few showers for the rest of the week after today. 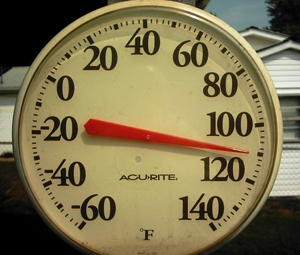 The heat is the major story throughout the south and many other parts of the US. The 100-degree streak in Dallas continues. Finally, Tropical Storm Emily is going to be the big story later this week for the southern United States. August monthly precip total: 0.00"